Just the 20 rounder extra power spring, which will work in the 30 rounder. The CMMG extensions do not have built in baseplates, they use the one that comes with the FN mag. 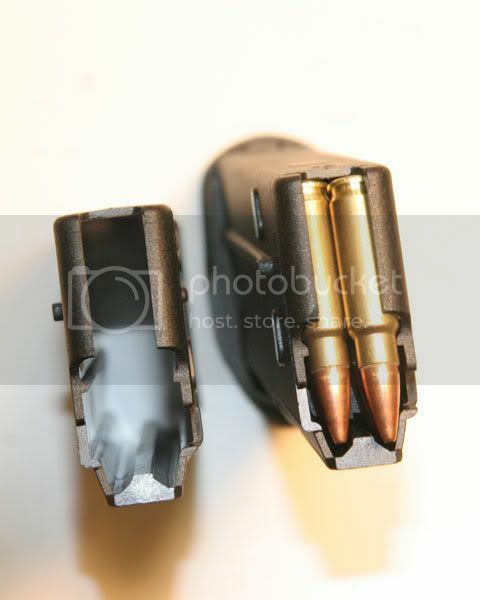 They do come with a replacement spring but as far as chaining them together to make 100rnd mags, no one has a spring that big and who wants a mag that when the gun is at eye level reaches down to your chest? Honestly, I wouldn't be shocked, AC. People have done dumber things that they deem cool or, in their minds, applicable to some fantasy scenario in which they get attacked by a mob of monsters. In fact, there are many of the examples on this forum, sadly. Although not as frequent in percentage as other forums, it is still sad. You're totally going to be eaten by a zombie. Maybe I can throw my tactical friend in front of me, he likes to wear Level IV plates he bought. That should protect him, right? You'd serve him to the zombies on a plate? Yeah, with no qualms. I mean, he probably fantasizes about zombies all the time and he has all the gear to protect him (skill?) in event of "SHTF" or "ZOMBIE APOCALYPSE", so I'd be doing him a favor by making his dreams come true, right? Anyway, we should merge this thread with the other CMMG thread, and get back on topic. We will be testing out a CMMG extension in two weeks. blueorison wrote: Anyway, we should merge this thread with the other CMMG thread, and get back on topic. Why test, mine work fine! Got 2 Promag 30 round magazines this week and they worked well, but did not slide in and out or seat as easily as the FN mags. Purchased 2 sets of metal lip protectors from Elite Ammunition, but they have not yet arrived. The pictures of the various mags were awesome. My question is if people have noticed any adverse consequences from this change, either with regard to the durability of the mags or reliability of feeding. As I recall, Glock tried using all-plastic magazines at first, then went to metal inserts. Surely there must have been a reason for this. Also, I'm searching for a reason why there were 3 failures to feed on my new FN in the hundred rounds I put through it today (yes, blue-tipped factory ammo). The rounds wedged at an angle, point hung up on the chamber rim. In correct. FNH has not changed how they make their mags recently and the steel is molded into the top lips of the magazine. Mithridates wrote: Also, I'm searching for a reason why there were 3 failures to feed on my new FN in the hundred rounds I put through it today (yes, blue-tipped factory ammo). The rounds wedged at an angle, point hung up on the chamber rim. New gun or crappy SS197 ammo. panzermk2 wrote: In correct. FNH has not changed how they make their mags recently and the steel is molded into the top lips of the magazine. I stand...er sit corrected. I took a closer look, and there is indeed some sheet metal molded into the magazine near the lips. The reason I didn't notice the metal is that it is matte black. In the pictures posted at the top of this thread, it looks like bare, silvery sheet metal. I'll see if I can figure out how to post pics to this forum. panzermk2 wrote: New gun or crappy SS197 ammo. panzermk2 wrote: I need to take a pick, but the recent batch of FN factory mags no longer have that small piece of metal in the mag body. Here we go. Also the FN verbiage is no longer present. Also the number of small hole like indents have changed. I was referring to the spar of exposed metal at the back of the mag. This spar like a plastic model spar, holds the metal insert in place in the mold as the liquid polymer is injected into the mold. Mithridates wrote: I'll see if I can figure out how to post pics to this forum. The "how to" for that is in my sig line. The 197 is anemic & made weak by FNH to appease the brady bunch peeps. EA's ammo makes better use of the capabilities of this round. However, you shouldn't have any problems with using 197 once your FsN is broken in. I occasionally feed my FsN EA ammo & then but I primarily use 197s without any problems. I have even put EA's heavy duty recoil spring in mine & still have no problem with 197s. Valorius wrote: I was hand cycling the weapon today over and over from 27rds to 20, and it appears to work perfectly (as logic dictates it should since the follower lip never reaches the problem seam area). I'll be going to the range within the next week and will test it extensively to make sure it's 100% reliable, but i am fully expecting it to work. Elite sells an extra strength spring for the extended 30rd magazines? I've tested the hell out of the technique of just using 27rds in the mag. I actually load them to 27+1 in the gun, and 28 in all the spares. As long as the 28th round is chambered manually when you insert a fresh magazine it works perfectly. I also tried loading them all to 30, even after shaving the seams, and i still had stoppages when they were fully loaded, so i will definitely be sticking with the downloading strategy. I have 13x 30rd magazines, so i have a pretty good body of samples to work with and form a sound opinion on IMO. Figured people might be interested in my results. Just a headsup, I have the new mag type Airdog pictures above, as well as the CMMG extensions. So first I want to say the extensions seem nice, with good springs. I only just got them in this morning, and only using one full mag, now 30 rounds in each of my 3 magazines, they fed fairly well; AFTER some grinding down of the new rib Airdog makes note of in his post. Just grinding at the baseplate end so the spring has a ramp to hit the rib seemed to do the trick, although the rib does make the included spring have a tighter than intended fit up the rest of the new mag type. I had one mag feed perfectly fine, one had one doublefeed, the other two(this after grinding). I guess its possible to grind or cut down the entire rib, but hopefully I'll get them working with out doing so. This is really only a fun gun for me though, so I cant say I'm terribly concerned over the performance. Since I travel, I wanted to have a couple of 10 round magazines be be compliant in certain states. So I bought a couple from a midwestern retailer. I thought they'd be made by FN, turned out to be Pro Mag (PM). My gun is new & the 3 original FN mag's that came with it are like the ones shown slightly before my post with the internal separator for the cartridge tips. The PM do not have this separator but the big problem, I have not live fired the PM's yet and see no reason to at this point, is inserting the mag into the gun. As soon as the mag contacts the mag release in the grip of the gun's magazine well, further insertion becomes increasingly difficult up to the point of locking into battery. 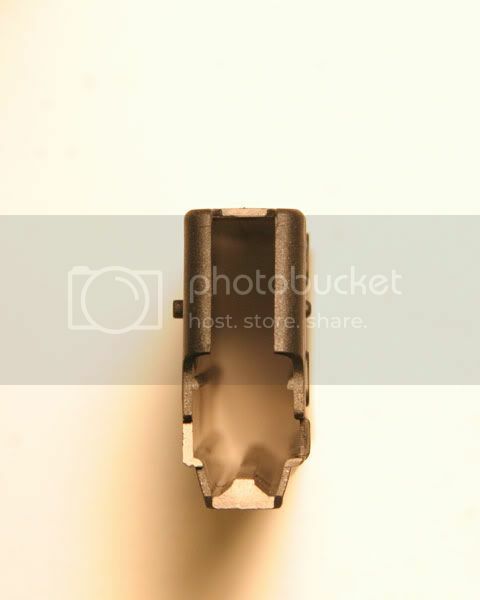 Then when you depress the mag release, the PM mag barely detaches, pops loose, from the gun and you must forcibly extract it from the magazine well of the gun. I have e-mailed and phoned Pro Mag (twice) trying to speak with Tyler their mold engineer about what I see as the problem With these mag's. Both have a date code of 08-08. I don't know if this code is the manufacture date of the mag or the latest revision date of the mold. I have contacted the retailer and asked them to hold back on selling these and their response seems to indicate they will. I prefer to work with Pro Mag to help them solve this problem but seeing I'm getting no response, I guess I'll have to send them back to the retailer as defective. In review of the PM mag, the problem is the exterior width from the mag lock notches to the top where the cartridges are loaded into it. The angled surfaces in the aforementioned area are too wide and rub on the inside of the magazine well. 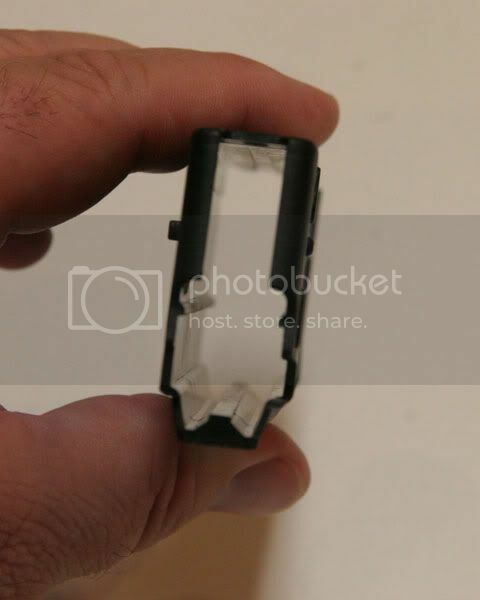 The rest of the mag width towards the case portion of the cartridges seems fine. It seems one person shortly before my post is experiencing the same problem as I am. 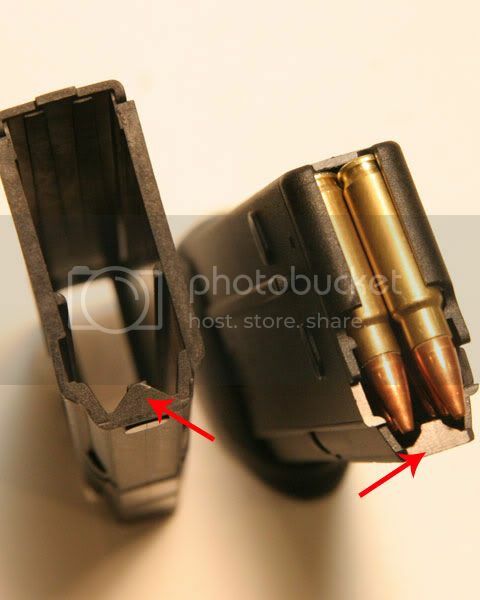 The 10 and 20 round mags seem to use the same exterior housing, so the problem exists in both mag's. Anyone else seen this issue with their PM mag's ?? well, that's interesting. The Mk2 I just got a few days ago...the magazine in the pistol had the new magazine with the vertical rib, but the two extras - no rib. Hope that isn't important, and also a bit weird that the Mk2 is new, the design change was over a year ago, and I'd still get old style mags?